Who likes to see dust on beautiful light displays, bulbs or lampshades causing hindrance in brightening your place? The dust on the bulbs or even car headlights not only blocks 20 % of the light but also make any place unwelcoming. It is an awful sight and needs to be attended immediately. There are many simple home methods that can be applied apart from various cleaning agents available in the market. Most of these cleaning kits are heavy on one’s pockets and even fail to yield desired shine back to your lights. Try the most trusted and simple home remedies on regular basis as outlined below for illuminating your area: It is important to remove bulbs from the fixtures, switch off electricity and let bulbs cool off before commencing to clean. Not many people know that using toothpaste can sparkle your dirty car headlights very quickly just the way they work on your teeth. All you need is to spread a little unused white regular toothpaste (and not the gel one) on piece of rag or an old toothbrush and simply scrub your headlight in circular motions till haziness disappears. Use a damp cloth to wipe the paste off from surface and what you find is a glittering shine beneath. There is no harm in repeating it once a month to avoid stubborn dust layers clouding on your lights. Another effective is to use silver polish on headlights and covering it with car wax to retain cleanliness for a long time. For delicate light items like lampshades made of cloth, silk or paper, use a duster made from lamb’s wool to carefully remove the dust. The duster will attract all the dust and will leave no trace of dirt behind. Attaching a brush to the vacuum cleaner will be helpful for highly embroidered and intricate shades. 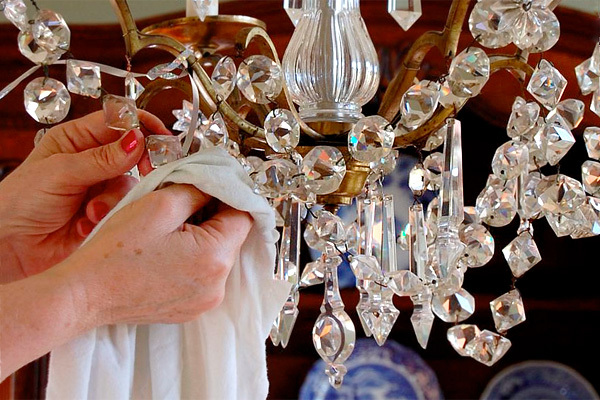 For home bulbs and tube lights, nothing can be as easy as wiping them carefully with a soft and clean piece of cloth. For glass shades of ceiling fixtures, use of soapy water is a best way to clean. Detach the glass shades and gently submerge them in soapy solution for some time. Wash them with clean water and wipe off with a soft cloth till dry. You will see they look as new as before. Wrought iron lights too can be cleaned using this solution. This combination works best when applied on glass chandelier hanging from your roof top. These big pieces cannot be dismantled or brought down so you have to use a stand or ladder to reach up to its height. Dry clean the crystals with lamb wool duster first. Then hang an umbrella upside down hooking its handle somewhere on the fixture. Spray the mixture of water and vinegar on its crystals till they are completely drenched. The umbrella under will collect all the dripping dirty water. Wipe crystals later with a clean cloth.